decisions is just so simple? You might have been lucky in the past and made successful decisions without following a proven process. However, should you leave the future success of your firm simply to chance? One of these flaws is creating just 2 options, thumbs up or thumbs down. This creates a narrow decision-making process. Generating a number of different options may seem to make your decision more complicated, but in creating alternatives you are forced to dismiss the ‘whether or not’ decision and widen the beam of your decision-making spotlight. When you widen the options the better your final decision is likely to be. Confirmation bias is another flaw in any natural decision-making process. Without realising it, bias habitually influences most of the decisions we make. How many times have you made a decision based on the fact you like one outcome more than the other? ​Discover a 4-part sense-check process for successful decision-making here. Learn how widening your options and questioning your natural bias will increase the likelihood of making successful decisions in your accountancy firm. 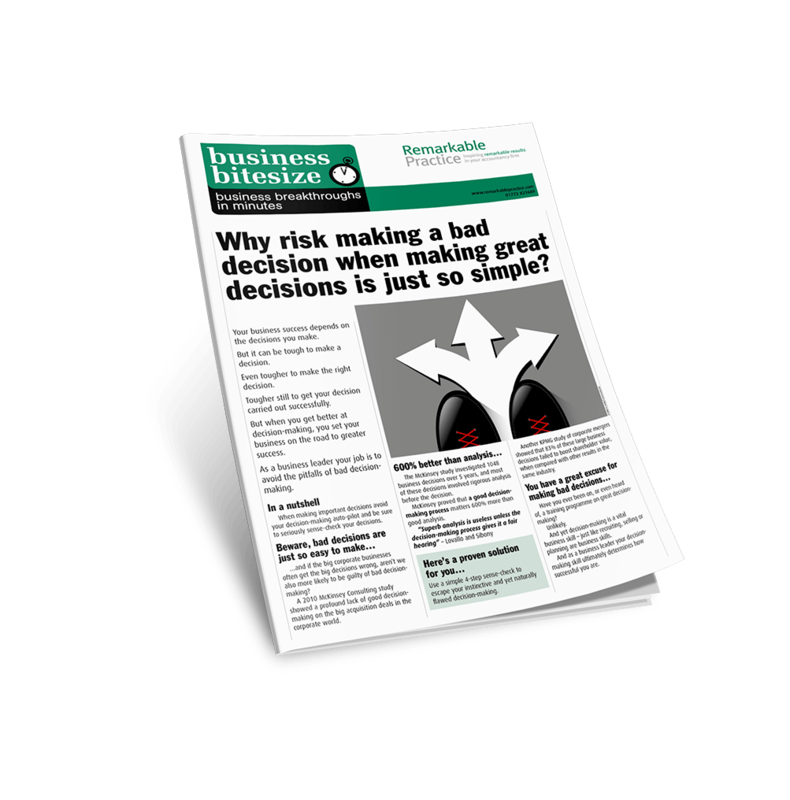 Want better than alright decisions in your accountancy firm?